In January, Dan and I had a mini break from the cold winter weather. 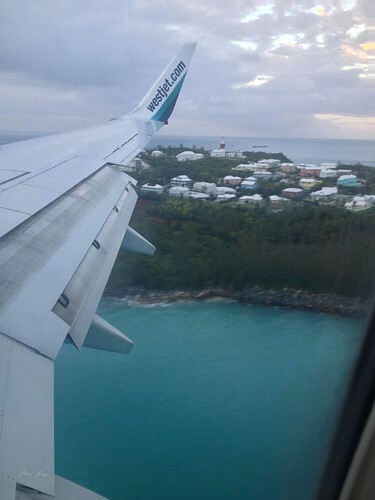 Just as things started to get really cold in Toronto we spent an extra long weekend in beautiful Bermuda. 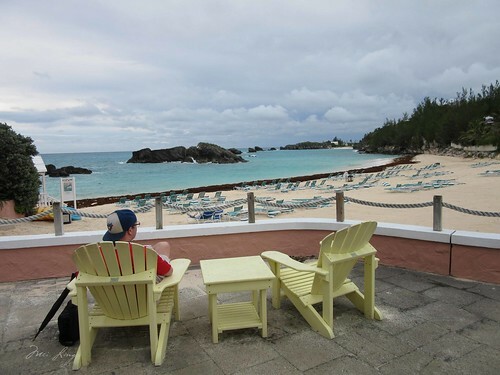 It was low season in Bermuda, which is located further north than the rest of the Caribbean and is in the same latitude as North Carolina. Typically low season also means rainy season, but we were lucky on our trip. Flying to Bermuda. It was so exciting! The purpose of our trip to Bermuda was so that I could run the Bermuda Triangle Challenge (more on that later). Basically it was a runcation. Our original flight was going to be on Friday morning, with the first race in the challenge taking place that night. Unfortunately Air Canada cancelled the flight and rescheduled us for Saturday. Obviously that wasn’t going to fly with me so we got them to refund our money and booked with West Jet instead for Thursday afternoon instead. Air Canada also cancelled our flight for the way home so again we were able to get a refund and book with West Jet. I typically don’t have problems with Air Canada so I’m guessing they just weren’t able to book enough flights during low season. Our flight was delayed so we ended up waiting around for a long time. As we waited, I couldn’t help but notice all of the runners also waiting for the same flight. You could tell who the runners were by their clothes. Some people had their running tights on, running shoes, other race shirts (I recognized a Montreal marathon shirt from 2012) and Garmin watches. As we boarded we ended up talking with another Canadian couple who were running the challenge as well. They travel and run races all over the world so they had lots of interesting stories. We later nicknamed them the “fast Canadians” because we never got their names. The flight was smooth and I watched Dolphin Tale 2 on the plane. When we landed I was happy to find that our luggage had made it with us. I had packed all of my running gear in my carry on just in case, but it’s still nice not to lose your luggage. We had arranged for a shuttle to pick us up from a hotel and ended up sharing it with the fast Canadians. After waiting around for a while we were in the shuttle and headed out. The driver received a call and we ended up turning around to pick up one more couple who had been on our flight. It turns out their luggage hadn’t made it and they missed our shuttle because they were dealing with the missing luggage. I felt bad for them. Then the fast Canadians asked them if they were running and the husband was. Fortunately he had his running shoes with him. We all sighed with relief saying that he had obviously travelled to run before. Everybody in our shuttle ended up staying at the Fairmont Hamilton Princess except for us. 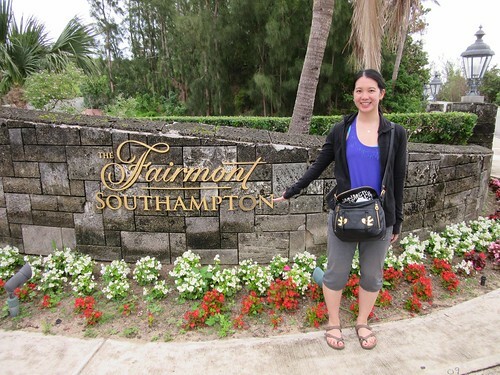 We stayed at the Fairmont Southampton, which was located a little further away. This ended up being a great decision because we loved our hotel. Outside our hotel. 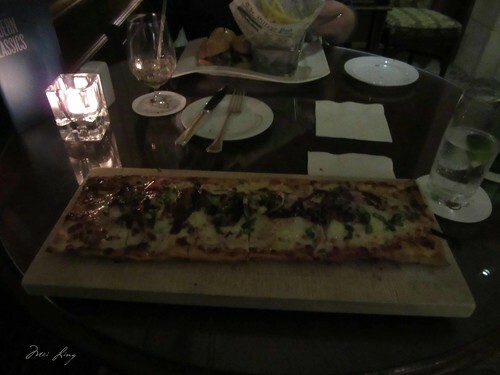 We loved The Fairmont Southampton and would definitely stay there again. When we arrived we were greeted and when we asked about food they recommended that we eat at the Jasmine Lounge, which serves food later into the night. 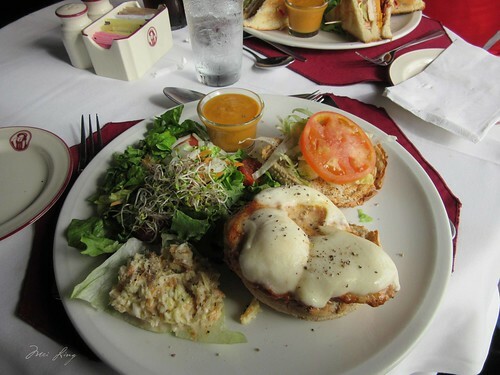 Fortunately for us, it happened to be Restaurant Week in Bermuda. This is the equivalent to Toronto’s Winterlicious, where restaurants offer a special pre-fix menu for a good price. Jasmine ended up being our go-to restaurant over the course of the weekend, both for its convenience and its yummy Winterlicious menu. That first night I had a bbq chicken pizza and Dan had some mini sliders. My meal also came with a caesar salad and a banana cassava dessert with coconut ice cream. My BBQ chicken pizza was huge! And delicious. Well worth the Restaurant Week price. 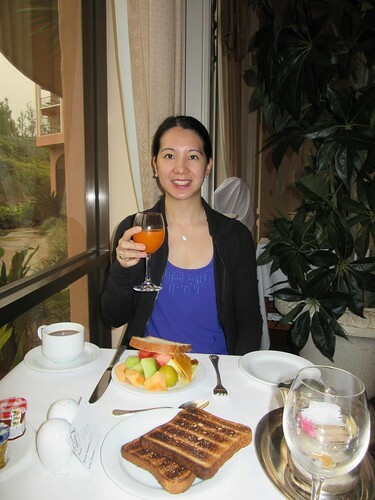 The next day we slept in (something we hardly ever do on vacation) and had a relaxing breakfast at the hotel restaurant called Windows. We both opted for the cold breakfast buffet and watched it rain as we ate. It poured the entire time we were eating so we just hung out enjoying our coffee and taking our time until the rain let up. The staff were really friendly and told us that they had ordered some nicer weather for us. We also heard that it always rains during the first race of the Bermuda Triangle Challenge – the International One Mile race. I hoped that it wouldn’t rain but kept reminding myself that it was better than the bitter cold that we had just left. Enjoying breakfast and waiting out the rain. After breakfast the rain did let up and after picking up the hotel umbrella (which we didn’t use once on our trip) and getting some directions we headed out for a short walk to Gibbs Hill Lighthouse. Everybody kept commenting on the 185 steps that we would have to climb when we got there. I thought that was nothing considering I was about to run a one mile race, a 10k race and a half marathon all in the same weekend. The lighthouse is one of the oldest lighthouses in the world that is made with cast iron. It is one also one of the oldest lighthouses in Bermuda and since it was so close to our hotel we decided it was worth a look. We went into the gift shop to buy our tickets for the lighthouse and saw a “Bermuda Triangle Insurance Policy” hanging on the wall. Dan works in insurance so we also bought one of those. After that we climbed all 185 steps up the lighthouse. It was fairly quiet and felt like we had the lighthouse to ourselves. On each landing there was a small display where we learned some of the history of the lighthouse. At the top we were able to go outside and enjoy the spectacular view. 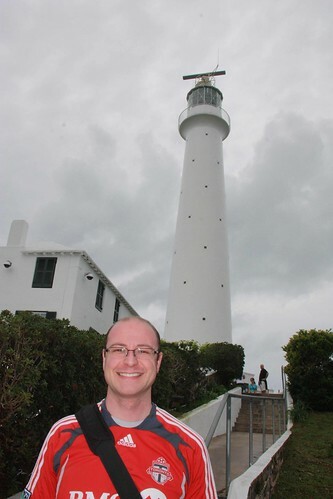 Dan outside of Gibbs Hill Lighthouse! On our way back from the lighthouse we stopped at King Henry VIII’s restaurant for lunch. I tried my first Bermuda Fish Chowder. It’s different from the chowder that I’m used to, which is something that I usually associate with being creamy and heavy. Instead, Bermuda Fish Chowder is tomato based and has a bit of spicy flavour to it. They serve it hot and then pour some dark rum on top. Delicious. I also had a chicken burger while Dan had a BLT. 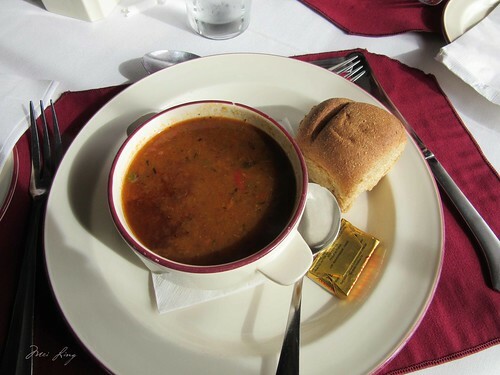 Bermuda Fish Chowder. Yummy. You can see the dark rum that was added after it was served. With our bellies full we walked back to the hotel where we explored the beach before hoping onto the trolley back to the lobby. Dan relaxing and enjoying the beach. It was stormy but still wonderful. After a quick rest we were ready to head out to my first race in the challenge! I was looking to book the Southampton so it’s good to read a review! We liked it a lot! Closer to the beaches (nice golf course too). Staff were really friendly and helpful and it’s easy to get transportation to get around the island (we took the bus everywhere).